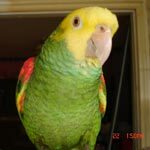 Parrot Forum • View topic - Toys . How boring can they be ? can not find any that even interest me, let alone my parrot. JoJo gets bored with toys easily. And I have bought most types that are available commercially. They are not cheap. Yet, I have to remove them because she tires of them and never plays with them. It's a waste of money. Re: Toys . How boring can they be ? Basically, the ones made out of some sort of colorful dried grass with little things that stick out and that they can pull out of it. But, right now, the male is chewing up cardboard boxes [and my magazines, and the plastic covers on the tables, and the back of the draperies, etc -LOL] like crazy. My Senegal is pretty good with toys. Nothing like the bigger birds but she definitely does chew them from time to time. However, her favorite thing without fail is to chew up her NU Perches. Especially if it's a size small but even medium. It takes her a good 3-6 months to destroy a perch which is perfect because by then it would be time to replace it anyway! Funny cause my bigger birds don't chew the perches at all. My advice would be DIY toys! Just look at any of the popular parrot toys you can buy, what are they made of, what are the characteristics they have and find some parrot-friendly materials! You will not only save money but also give your birdie something unique! Not to mention all the fun you will have! What is is that your parrot likes to do? Let that be inspiration for parrot toy crafting! Normally Senegal are big wood chewers. Try diff kind toys. Thin wood, thick, paper, cardboard ect. My caique likes balsa & puzzle pieces. I make his toys. He also perfers foot toys over anything. Have you tried foot toys? I not only bought toys but most of my birds came with their own little cages with toys. With the Cockatiels their favorite thing to do is swing. I have multiple swings set up. They also like sitting in the window watching the activity outside. Every now and then I give them small cardboard boxes to tare up. They have to be small so they won't get the idea to nest. The only toy my Amazons play with are the ball within a ball with a bell in the middle. Both love to tare up boxes. Myrtle likes the chain I have at the sliding glass door that she swings on. She spends a lot of her time on it. Rainbow found my step stool in the kitchen and moved in. I give her cardboard under there and she spends most of her time in there. None of them are big on toys but find things to amuse themselves. Yep, that's the way they do it in the wild - no toys there.